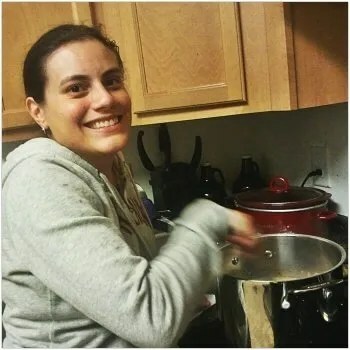 My husband and I have started a new hobby and last night we spent the whole evening together working on a project that we’ve wanted to do for a bit – we brewed some beer! While I wouldn’t call it frugal (at least right now with the upfront costs) I will say brewing at home is a lot of fun. I’m tired and I look like a mess, but I’m happy because I’m brewing! Like many people who have had thoughts of making their own beer, the motivation for us was fueled by some really fun local beer brewery tours. We had been to a couple tours here in Raleigh and were very casually thinking about trying to make some beer some at home. When we visited family last month in Virginia, my brother in law and his wife took us over to Smartmouth Brewing to taste some of their beers. While chatting with them (and drinking of course!) we thought more about making some at home. They had a friends that brews and my brother in law was getting some equipment so he could homebrew and entertain all their friends at the house. We thought would do something similar We have a great buddy that brewed his own mead and we loved it. Having someone that we know whom we could ask questions also motivated us to think about it. We needed to get some equipment to get started. We decided to look around with beginner’s kits and price shop. Since don’t always on agree on drinking the same beer, we wanted a set up that would allow us to brew two batches at a time. The time added would be minimal and looking at costs, it basically came down to grabbing an extra bucket. We found a few online sets that were in our budget, but we still had some questions about what we needed so we stopped by a local store that our friends recommended. We went to American Brew Masters, a local brew supply shop right here in Raleigh. They had everything that we needed and Jeff suggested a more affordable setup than the one that we had seen online. He felt that we should try brewing a few times and then decide if we wanted to keep it at that level or if we wanted to upgrade. Since they seemed honest and their prices were very reasonable, we took their advice and bought the set from the them. In addition to equipment that came with the set-up, we also got an extract recipe kit for free. Since we both wanted to have a batch going, we picked up a second recipe kit. Looking at the time involved and our schedule for the next few weeks, we decided to set aside time Saturday to get the 5 gallon brews done. You may be wondering then what we were doing last night since I mentioned that we brewed a batch. Good question. So seeing as we’re still quite new to this and not really wanted our very first batch to be 5 gallons, we tried a one gallon all grain brew kit using Brooklyn Brewshop’s Chestnut Brown Ale Kit. For $40 it pretty much included everything we needed to make the batch except for a funnel and a brewpot. We used the soup/stew pot we already had and it worked well. I think for those that don’t know if they’d like to homebrew on a regular basis, having a small kit can let you test the waters. It’s also great for couples leaving in smaller places as the equipment can fit in the corner of a typical kitchen counter. Now it’s just the waiting game with our first batch as it’s fermenting right now. I will definitely write something up when it’s bottled and ready to drink. We’d love to get your tips and stories if you have home-brewed in the past or are brewing now.